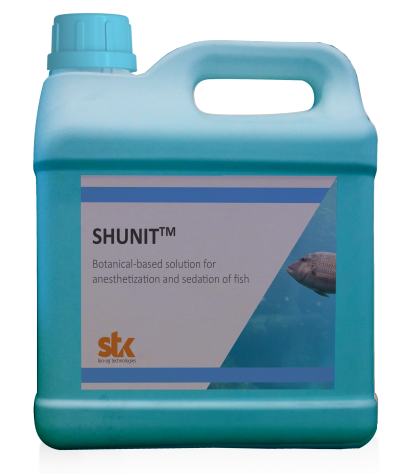 The STK Aqua protection division offers a range of do-no-harm botanical fish sedative solutions that previously did not exist in the market for improving the daily management of fish, helping to increase their survival rate and enabling safer, healthier and more abundant production. STK Aqua protection is the Veterinary Unit of the STK bio-ag technologies, develops and commercializes products based on our proprietary, patented intellectual property for the growing aquaculture industry. STK Aqua provides cost-effective solutions to reduce mortality in fish, shrimp parasites and other aquatic organisms. STK introduces Shunit, Shaldag and Timorex Ec. Our products improve animal welfare and increases survival. Our solutions are based on innovative formulations of natural organic compounds extracted from plants and thoroughly tested in clinical and field tests. Our fish health specialists are ready to provide technical support and answer any questions you may have.